A bunch of groups in Sacramento, including Sacramento Freethinkers Atheists and Nonbelievers, Sacramento Area Skeptics, Atheists and Other Freethinkers recently had a Pastover event. 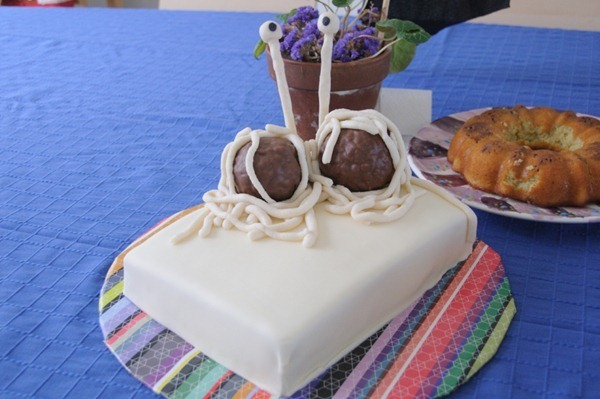 Among the many pirate events I created this cake to celebrate his noodliness (Red velvet inside, in celebration of tomato sauce). We also ate pasta and meatballs. I’m just sitting here twiddling my thumbs waiting fo the Apocalypse to begin. A few minutes ago I thought I felt lighter, like I could float up to meet Jesus in the sky. But then I farted and the sensation was gone. Guess it was just gas. Well, the day is young, although it’s nearly May 22nd on the other side of the International Date Line. Atsap: You are – I believe – old enough to remember a great country music song about Elizabeth Taylor: “…I’m just sitting here waiting, ’cause I know that, sooner or later, she’ll get around to me…” It’d be interesting to be able to compare Liz/Apocalypse probabilities quantitatively. And thank you (and many gutsy others) for exemplary resistance to youknowwho. I proclaim that May 21st hereafter be celebrated as National Harold Camping Day and that Harold be made a Saint, the Patron Saint of Gullible Fools. Harold has out-Popoffed even the greatest of the great religious charlatans. What’s with this Chinese spam? Why so much? It can make a site unusable. Is there no spam filter or moderator? Believe it or not, it’s Japanese. This Japanese spam from ooobrands is prolific. Some comments pages of diverse sites have several thousand spams from them and have been rendered unusable. I’m amazed they have not been traced and stopped, the scum! 25% of comments are now ooobrands spam. Watch it increase to 100%. My research. Japanese spammers are jailed, even for ‘intending to spam’. Chinese spammers, once located, are sent spam every 20 seconds telling them to ‘hand themselves in for punishment.’ I believe that the spamming of spammers is illegal everywhere but China. Dear Keith, For you, here’s a riddle with a twist: (I’ll supply the Answer and you must supply the Question) Here goes: Answer: Chicken Sukiyaki. A-HA! So you know that Keith is faking his fuki, too, huh? I’m seeing some deep fried love there. Let’s see if an Orshtraylian “gets it”. Tezuka Hishashi? (Presumably not related to Tezuka Osamu). I should say here that I cannot read or speak Japanese. I just recognised some Hiragana in the spam mail, which is something the Chinese don’t use.